More people are starting to look at what we’ve done to this planet, especially since the birth of the technological revolution. Our oceans have been suffering for a very long time, with countless oil spills and toxic waste dumped into them every single day from industrial practices and more. Despite having numerous ways to operate in a fashion that is more harmonious with the planet, we continue to choose to destroy our planet on a daily basis, and we can’t afford to do that anymore. Despite how much our planet is suffering, people everyday are starting wake up and realize that we really do need to look at, question, and change the way we operate here on planet Earth. This shift in perception alone can help springboard us towards change, and creating a new experience for us and other beings who we share the planet with. Whales have been showing up dead on multiple beaches, bringing us a message with stomachs full of plastic. This has happened multiple times. In the summer of July 2013, a sperm whale was stranded on Tershelling, a Northern island in the Netherlands. The whale swallowed 56 different plastic items that totalled over 37 pounds. In April 2010, a gray whale died after stranding itself on a West Seattle beach, it was found to have over 20 plastic bags, small towels, surgical gloves, plastic pieces, duct tape, and more in its system. In March of 2013 a dead sperm whale washed up on Spain’s South coast which swallowed 17kg of plastic waste. The list goes on and on. Keep in mind, these are whales who choose to beach themselves or have washed up on shore, think about all the whales and other marine beings that don’t. These are not uncommon events, in 1989 a stranded sperm whale in the Lavezzi Islands died of a stomach obstruction after accidentally ingesting plastic bags and 100 feet of plastic sheeting. 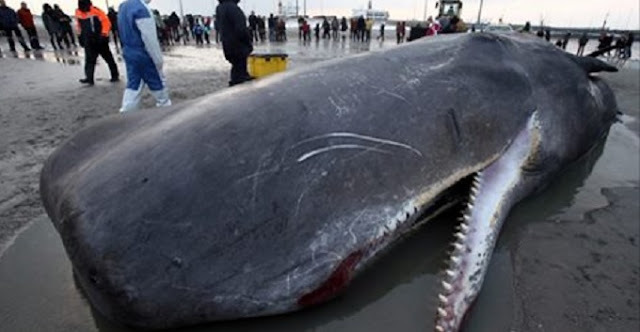 A paper published in 1990 reports that a sperm whale in Iceland died due to a complete obstruction of the gut with plastic marine debris. In August 2008, a sperm whale washed up dead on the beach near Point Reyes, California, with 450 Pounds of fishing net, plastic bags and rope found in its stomach (see picture to the left) In 2008, the California Marine Mammal Stranding Database recorded another sperm whale with enormous amounts of plastic and fish netting in its stomach. I’ll stop there as there are countless examples. By now, you’ve probably heard of “The Great Garbage Patch,” it’s an area the size of Queensland, Australia where there is approximately one million tonnes of plastic spread throughout the ocean. Drag a net in any area of this part of the ocean and you will pick up toxic, discarded plastic. We’ve shown this video before, but here it is again just incase you missed it. With the Fukushima disaster and the famous gulf oil spill in 2004, as well as many more we don’t even hear about, I’m surprised anything at all is alive in our oceans. These events, and many more should stop everyone from their daily routines, just stop, and say no more. The world should not continue forward, people should not go to work, it’s time for all of us to stop, come together and change this world. Now is our window of opportunity. These events should really serve as triggers for us to wake up and change our ways. A mass collective desire to change these things is what has, and will put the human race on a journey to do so. It’s time to educate ourselves about what is really happening on the planet, and bring awareness to the most important issues we must tackle today. This is why alternative media outlets are so important, they bring awareness and shed light on what corporate media hardly covers. Our planet is calling on us to change our ways, and the change starts with you. At the same time, our planet is calling for a massive transformation. All of the corporations and toxic industrial practices must stop what they are doing. New, clean , green technology is available and we could easily replace all of these plastics with hemp, and much much more. We have so many solutions, yet we do not implement them. I want to provide solutions to this problem, and it’s hard to come up with them other than making changes in your own lives. There are wonderful individuals like this one, a 19 year old boy who developed a cleanup array that could remove over seven million tons of plastic from our oceans.